Deep inside they are ready for Spring. Beautiful work, excellent! I think you are right, Chris. As much as I love winter, I look forward to spring, too! Thank you. My pleasure! Looking forward to seeing your pictures of Spring and Summer! They are so delicate. A little bit of warm breath and they would disappear. Thank you, Helen. These are so wonderful. Nature truly is amazing! I agree, Ray, I am constantly in awe of nature. Nice title, Karen. 🙂 The images and words bring to mind fairy tales – don’t ask me why – I’m certainly not complaining! Lovely! One would think these would be from a fairy world, maybe? Thank you, Steve! Thank you, Adrian. It was a joy to find these little branches like this. 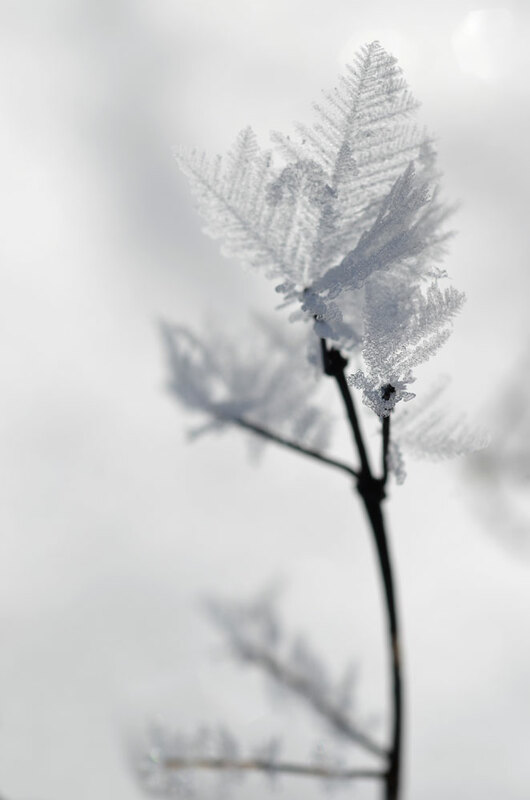 Delicate branches, as white as pure mammoth ivory–yet as fragile as a paper-thin dress. How cool is that?! Ghost leaves. Ghost leaves, I like that! I thought they were pretty cool, too. Just absolutely delightful, incredible, cold, and charming and….super! Thanks very much, Christian. They only come out when it’s cold! What a great word – frondescence – that should be the new word of the decade. It is a great word! I didn’t make it up. Somehow it seemed perfect for these. These are magical! Great word. Thank you, Jane. I was happy to find these little frost blooms. Your powers of observation are incredible Karen. The subjects you find are simply amazing. I have never seen anything like these crystals is it a common occurrence in your area? Is it because of the climate or location? At any rate they are fantastic images beautifully captured. Frost is quite common but to see these particular formations is less so. The conditions have to be right: very cold! 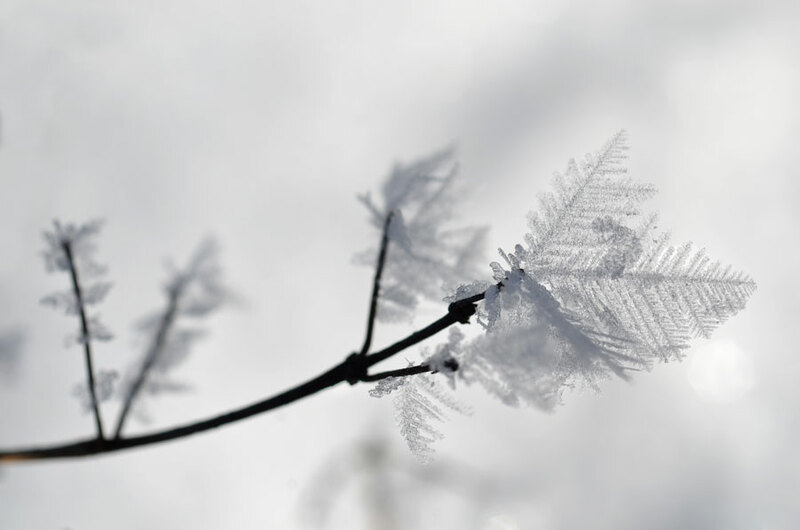 – around -15c or colder, and there has to be quite a bit of water vapour in the air to allow them to grow. An open part of the river nearby was the source of water vapour. They also don’t last too long. BRRR that’s cold, unlikely I’ll ever see them down here in Louisville our winters are much milder than that. Thanks for explaining how they are formed; maybe sometime I’ll be far enough north to find some myself. Nice shots, composition, and light! Wonderful Karen! Is it possible for nature to be ironic? Beautiful shots, Karen! That’s a good question, Richard. Maybe! They are cool, I agree. Thank you, Gigi. If you like freezing cold this is the place to be! Lot’s of cool things to see when it’s cold. Like when somebody feels their phantom arm or leg. But not dark or painful. Beautiful images and idea. I meant to add ‘transcendent’ as well. They remind me of the wings of some delicate insect – like some lacy moth. Exquisite images again, Karen. Hi Distan, yes they are lacy, aren’t they? Thank you. You make the world so magical. At risk of sounding trite, i can’t not say this (again): i’ve never seen anything quite like this before… Lovely. Yes, they do look like that! against the gravity let alone why they are there in the first place. ??? Yah, it must be a magic ! 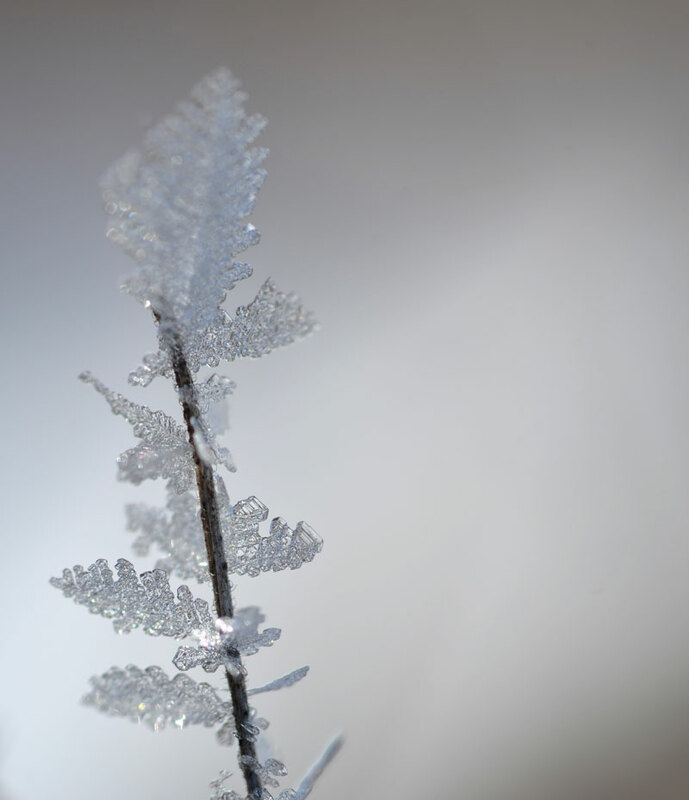 amazing those little delicate frosty leaves! So beautiful, and magical! Stunning work…by both of you…you and Nature…. Thanks, Scott. I was lucky to find these. Just when I am thinking that ‘Karen can’t really come up with anything else that is unique and will blow me away’, what do you do but do just that! These are really wonderful, and once again something that I have never seen before! Oh, Wow! Fantastic, fragile, fantasy fauna! Sorry for the late reply! Thanks for all your wonderful feedback – your comments are so thoughtful, and appreciated! Colder climes have their own magic, I think. The novelty starts to wear off around the end of February, though! I love the idea you have created.. These are phantom leaves..
I’m with John on this one … magic.